Wine For Blondes is not just for Blondes. Its for anyone interested in wine… from “Wine Blondes” to wine experts. We are the next generation of wine drinkers and our motto is simple: Drink Yourself Smart. We approach wine from a fun laid back point of view, and make it easy and enjoyable to learn about. At Wine For Blondes, you will meet a host of interesting characters working and playing in the industry. We will debunk and explain funky wine customs, myths, and traditions and translate wine speak into usable jargon. But most of all, we will have fun, with wine. BTW- In the photo to the right, Megan and her wine dog, “Moose” are hanging out in the vineyard. 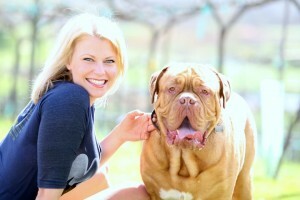 Moose is a two-year-old (140 lbs) Douge de Bordeaux, or French Mastiff. These Dogues fought bears in colosseums across Europe and guarded vineyards in France. They drool a lot, but quickly become your best friend. Give Moose a shout out!